This girl has had a much better week. Although her cold is still lingering, she is much better. In a way I am relieved to be over and done with the first cold. When we left the hospital and were told to isolate her, my fear of her getting sick was intense. Being past it now, and having it be such a small blip on the radar is a relief. Knowing that she can handle a cold like any other kid feels amazing. I do think the fact that she’s still almost exclusively breast fed helped immensely. I am really loving the interaction this project is bringing. Having people comment on my photos, link to them, commenting on others, discovering other mommas out there like myself. It’s fabulous. Although what’s up with not being able to comment on a blogspot blog from an iPhone or iPad? Not cool. This weeks photo comes from our morning routine. We go out into the kitchen, I put her down on her lamb skin on the floor and out comes the kitty to say hi. These two have become quite good friends in recent weeks. The cat is quite patient with her, which is surprising. 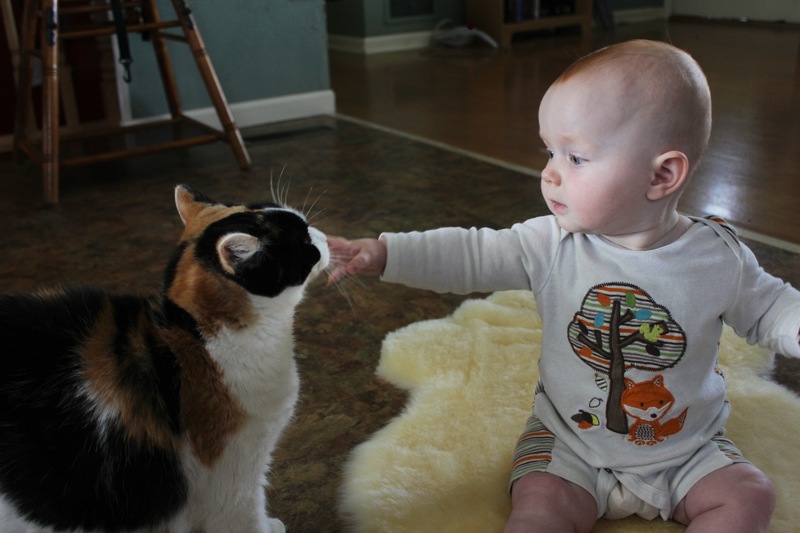 I’ve been trying to teach my babe to be gentle, as her first instinct is to grab the biggest handful of cat and pull. Eventually the cat lies down on the lamb skin too, and rolls over on her back. It’s a pretty cute routine that the two of them have. I love watching her interact with animals, she is becoming so fascinated by them. Last week I had a really difficult time choosing one favorite. I’m a sucker for a portrait in a mirror so this one caught my eye again, I loved the light in this photo, thisimage looked very familiar as I know those blanket kicking ways. But I think this one was my favorite. I love the light, the gesture. It spells comfort. Hope everyone is having a wonderful Mother’s Day today! Aw, thanks for linking to my page. I love the interaction this project has brought as well! Glad your little girl is feeling better, she’s darling. Hey you are right… why they don’t let us to comment from our iphone???? That piss me off. It’s a great experience to get into other blogs and saw those gorgeous children and also gorgeous shots taken. It have become my new adiction. I agree! And I’m never on a computer. The other day I spent over an hour on the actual computer going from blog to blog that I wanted to comment on and catching up! Oh thank you so much for popping over and then writing your lovely words about by little Squeak so completely flaked out on her Daddy – it means a lot that you took the time. Thank you.